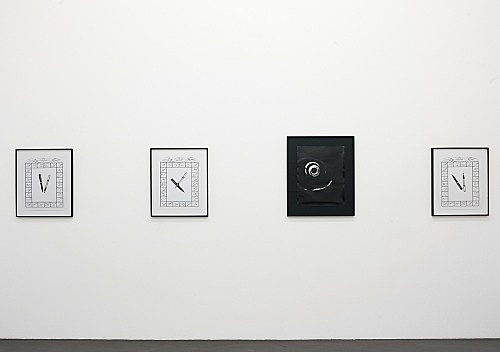 Sam Lewitt, for his first solo exhibition at Galerie Daniel Buchholz, presents Printer, Scriptor: Folios. 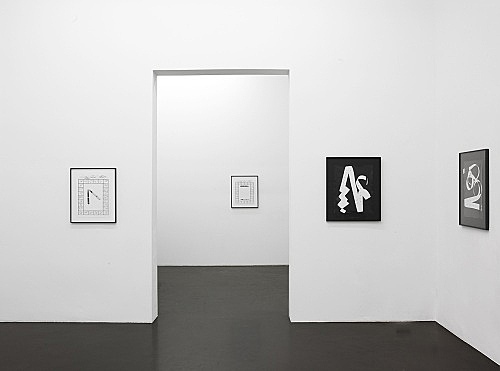 The work in this exhibition is collated into several groups of graphic matter derived from a source assortment of elements that are variously reproduced, displaced and situated as a display. The formal strategies of graphic depiction that are here deployed comports this material in a manner not unlike choice elements retrieved from the dustbin of a defunct printer’s shop; and much of the source material for this work was acquired from such establishments. 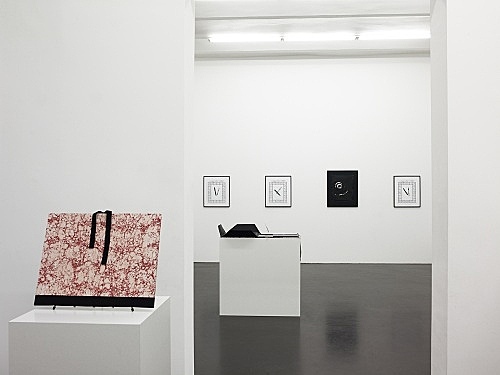 Portfolio cases are displayed on pedestals within the gallery. As framing and storage equipment, these objects suggest themselves to a collected content making a momentary appearance. 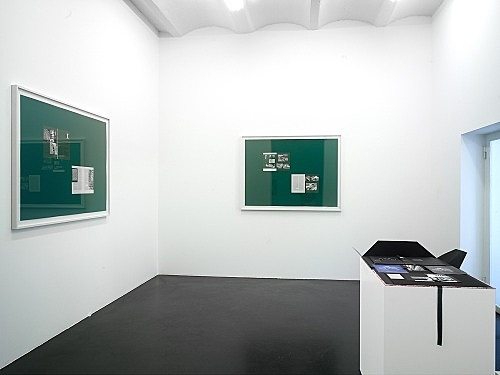 Paper – its role as support, its propensity to effacement, to abstraction and inscription – provides the model for such a thing as will be written, and read, out of existence. What exists in the hold of the portfolio often includes a memory for which the pulp of an unstable pH commingles freely with the acid-free backing of a durable existence. Document holding devices serve as an exemplary case for value’s heteronomy: singular products potent with the prospect of accruing a speculative surplus value convene with industrially printed paper. The storage logic of the portfolio facilitates an equivalency of value for its contents. But this with the trait of holding for posterity those moments when paper returns to view as an unsettled support, one for which the efficacy of images is fossilized into a fetish. Bordering these open cases: The work in Monograms is cobbled together around two tools for alphabetic inscription derived respectively from the realms of material production and exchange. 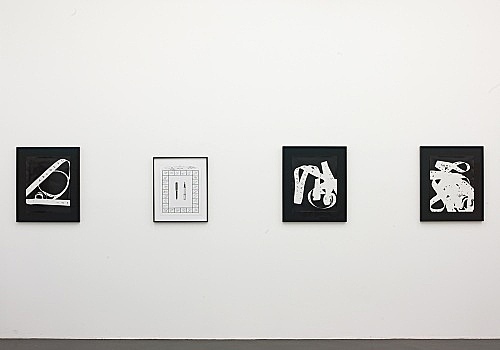 Ink drawings of an image of two pens, clipped from a newspaper advertisement and re-scaled to approximate actual size, are multiplied and composed into iterations of their physical spacing with regard to one another. These images are manually re-produced using the ink that they ostensibly contain, traced and filled-in, excluding only logos and corrections to coherently pictured depth. These find counterparts in a series of photograms made using reams of outmoded, industrial “Phototype”: long film negatives which have entire font families printed on them. The receding graphic/alphabetic symbols that are piled here index a material support for language – one made visible on condition of the enervation of communicative signs. The notice given to a stable medium for grammar in Monograms provides an approach to the attendant positioning of its support in Printing Progress: 1959. 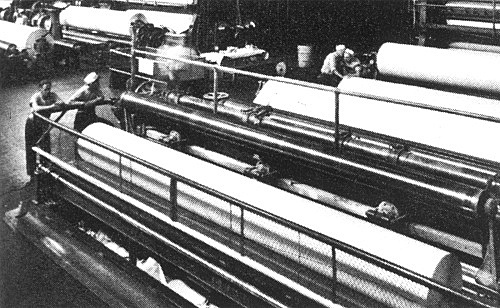 Two decollated page folios from a mid-20th century report on the paper-making industry supply the source images for this work. 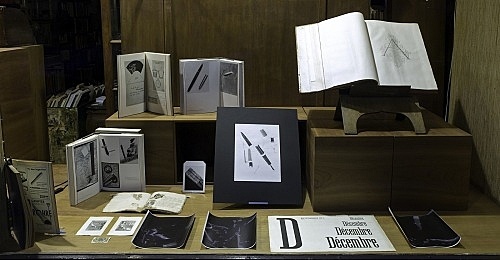 These page’s contents have been variously rendered by graphite tracings, which have then been pasted onto perpendicularly positioned page layouts; shifting the horizontality of the book to large, vertical sheets. 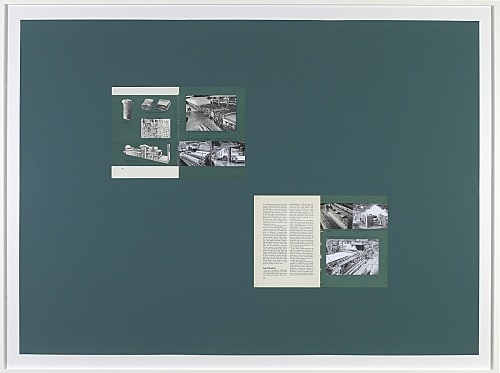 An additional alteration occurs in the drawings within this work: the photographs from which the tracings in Printing Progress are derived have undergone, in their graphic transcription, the extraction of the images of people originally documented in them, staffing the moving parts of industrial papermaking machines. In both of these image collections, I imagine the ambiguity of what purpose possesses these objects to be in direct correlation to the dispossession of their instrumental worth: out-stripped in efficacy by pixilated information and equipment far more interface directed. 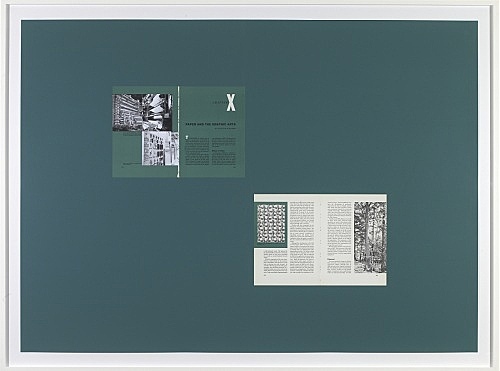 But if current fantasies of flexibility and connectedness have accelerated new means of rendering and displaying old goods, then I appreciate the reproduction of these images – sourced from forms of production and consumption oriented toward disappearance – as having emblazoned their foundational supports with instabilities that call ahead a reservation for their successors to the width of closing portfolio folds. The material of a written world left behind by shifts in economy and conditions of legibility has recently been the material for my own production as a collector. By force of what concerns the perception of social-relations as objects – which in turn are made to stand with regard to their collection – I’ve disassembled some holdings for this exhibition.